Welcome back to Future. Thanks for subscribing. Consider inviting your friends and colleagues to sign up. And if you have any tips or thoughts on what we can do better, just hit reply to this email or shoot me a message at steve@axios.com. For Californians — many of them inured to routine annual fires, mudslides and earthquakes — a key question is not whether to rebuild when catastrophe strikes yet again. It's whether they can afford it. Driving the news: For many fire victims, insurance — or the government — makes it so they can rebuild on the same lot. But in some of California's most recent spate of fires, this money hasn't been enough. And a lot of experts see signs that more homeowners could find it hard to rebuild as insurers reassess the risk of a new future of fire. 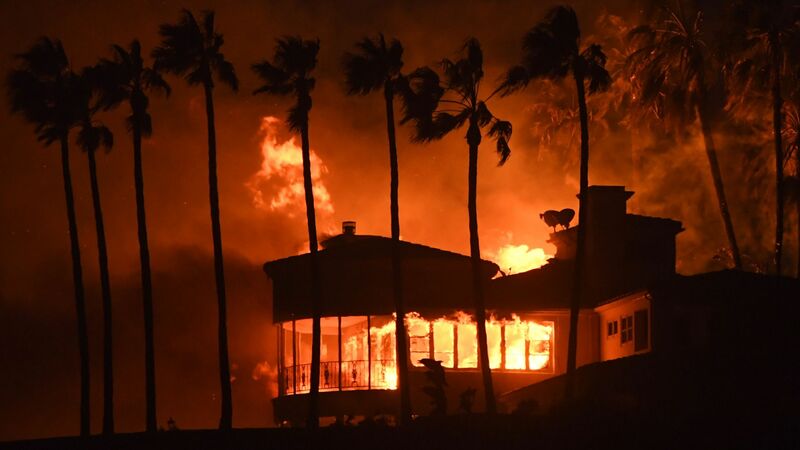 Kaveh Waddell and I looked at the rebuilding phenomenon: Since the middle of the last century, fire has destroyed an average of 500 homes a year in California, according to the Western Ecological Research Center. The number of vulnerable houses keeps growing: According to a 2014 study by the Nature Conservancy, builders in the state are on track to add 645,000 homes in highly fire-prone zones by 2050. Judging by history, these new homeowners will view any fire as an acceptable hazard of living where they choose. In 11 California fires from 1970 to 2009, builders reconstructed 94% of the burned homes within 25 years, the NYT reports. But the level of danger may be growing too high: Insurance losses from California fires last year were about $12.5 billion and this year could be about $6.8 billion, reports Don Jergler of Insurance Journal. After this season, insurers could decide to stop issuing fire insurance in high-risk zones "because they are contributing to people building where they shouldn't at all," says Dante Disparte, founder of Risk Cooperative, a DC brokerage that provides insurance to insurance companies. In Redding, 190 miles north of Santa Rosa, the site of the horrendous 2017 Carr fire, insurance companies are already hiking rates or canceling policies altogether, said Brad Garbutt, a broker at local Vista Real Estate. "I think you're going to see the major insurance companies stop writing in this area." The question, Disparte tells Axios, is "should there be residential property that close to forests that are tinderboxes? Should we push back human habitation?" Christopher Thornberg, a professor at UC Riverside and founder of Beacon Economics, said people should be free to live where they want — as long as they are covering the full cost and not relying on government services to bail them out in a catastrophe. "Raise people's insurance costs to cover the real threat and let them make the decision where they want to live," Thornberg tells Axios. Despite the danger, demonstrated again and again, many in California's wine country, where fire swept through in the summer of 2017, have chosen to stay. The Tubbs Fire destroyed 4,658 homes near Santa Rosa, authorities say. Its footprint closely mirrored that of the 1964 Hanley Fire; parts of the area burned again in 1986 and 1996. Authorities moved fast to rebuild: Santa Rosa fast-tracked permits and waiving fees, the Santa Rosa Press Democrat reported. California’s fire-management agency has labeled some of the areas being restored “very high fire hazard severity zones.” But John Allen, CEO of APM Homes, a local home builder, tells Axios that residents understand the risks. "A community is people. It's not buildings, it's not sewer pipes, it's not infrastructure, it's not a town hall, it's not a school. That's why they're rebuilding: They want to remain intact as a part of this community." A lower-income city than Santa Rosa, Redding has not seen nearly the same vigorous rebuilding effort since fire burned 1,079 homes last July, and produced only the second-known large fire tornado in history. More than a thousand homes are still on the market, said Garbutt, the Vista Real Estate broker. Among the unforeseen costs of remaining are obtaining permitting, hiring contractors and meeting new fire-safety codes. Insurance policies only cover the cost of rebuilding a burned-down home; they don’t cover upgrades to meet relatively new fire ordinances, like the use of non-combustible roofs and other materials. "I suspect we'll have more people leaving and less people rebuilding," Garbutt tells Axios. "People who don't have families here may see this as an opportunity to move away, maybe to areas that are less fire-prone." "They don't want to be in the path of the next one, because this was really traumatic." But, but, but: Garbutt said some people are betting that building will return to Redding. One local developer, he said, for instance, is buying up lots to hold for future construction. In a potentially significant political trend, almost half of 6- to 21-year-olds in the U.S. are Hispanic, African-American or Asian, according to a study released today by Pew Research. Axios' Stef Kight writes: Rapidly changing American demographics will have a profound impact on elections, government policies, economic opportunity, and more. "How we deal with this racially diverse generation ... will say a lot about how successful we will be as a nation," says Brookings' William Frey, author of "Diversity Explosion." The political impact of changing U.S. demographics can already be seen in the high turnout of young Americans in the midterm elections, Frey tells Axios — an estimated 31% of people 18 to 29 voted, the highest since 1994. For Republicans, the threat is that younger generations, tending to care about abortion, gay rights, and immigration, will flock largely to Democrats, Frey said. The most notable change has been the rise in the share of Hispanics. A quarter of the post-millennial generation is Hispanic, according to Pew, a growth of 7 percentage points since millennials were their age. The youngest generation is also the most highly educated, with 59% of 18- to 20- year-olds enrolled in college, compared with 53% of millennials when they were the same age. More than half of Hispanic and African-American 18- to 20-year-olds are enrolled in college, while 34% of millennial Hispanics and 47% of millennial African Americans were enrolled when they were the same age. The share of 18- to 20-year-old Hispanics who have completed high school grew by 16 percentage points, to 76%, while the share for African-Americans increased from 71% to 77%. 90% of Asians in the youngest generation have completed high school and 78% are enrolled in college, compared with 86% and 74% of 18- to 21-year-old Asian millennials. In May, Walmart put the kibosh on cashierless shopping — it said that its customers aren't so interested in possibly faster checkout without human help. But tomorrow, it's trying again. Axios' Erica Pandey writes: In Dallas, Walmart's Sam’s Club will launch "Now," a cashierless store half the size of a normal Sam’s Club. It will be a testing ground that will include augmented reality and mobile checkout. The opening comes 10 months after Amazon opened Go, a cashierless store in Seattle, arguably setting Walmart behind the latest big trend in retail. But in a report today on its third-quarter earnings, Walmart reported a solid 43% jump in e-commerce sales, suggesting that the company may simply be following a differing path. Axios' Courtenay Brown reports: The surging online growth has been fueled by the acquisition of Jet.com, an e-commerce startup. "Ever since the Jet.com acquisition in 2016, their overall growth in 2017 and year-to-date growth in 2018 has been stronger than it was before the acquisition," Sucharita Kodali, research analyst at Forrester, tells Axios. The Stone Age ended a long time ago, but Goldman Sachs hasn't forgotten. It's acquiring a Tokyo-based company that makes business cards, posters and other paper products from limestone. TBM has been attempting to raise $27 million from investors, Bloomberg reports. The secret sauce — its limestone process requires no water, a big advantage over the usual method using trees. In this case, 1 ton of paper can be produced from less than a ton of limestone. It's the equivalent of using about 20 trees, and saves about 100 tons of water.